Boves is a village about 8 kilometres south-east of Amiens. 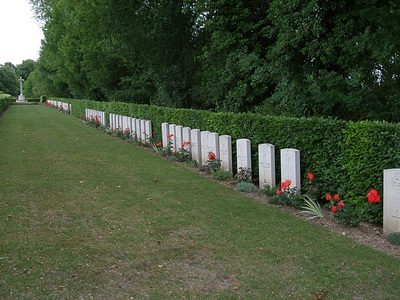 Enter the village of Villers-Bretonneux heading west on the N29 - E44 going towards Amiens-Longeau. 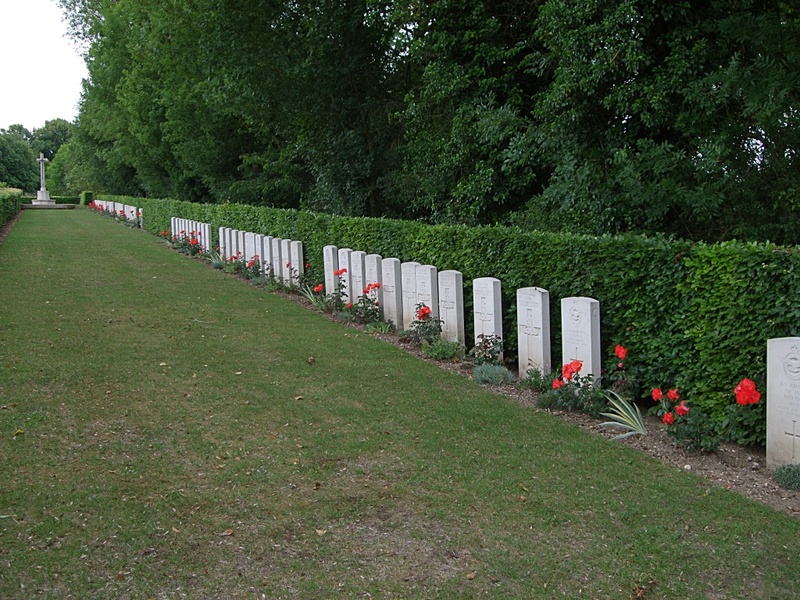 6 kilometres after leaving Villers-Bretonneux turn left in the direction of Boves on the D167, heading south-west. Once on the D167 carry on for 2.4 kilometres. At the crossroads go straight across in the direction of Boves, staying on the D167. 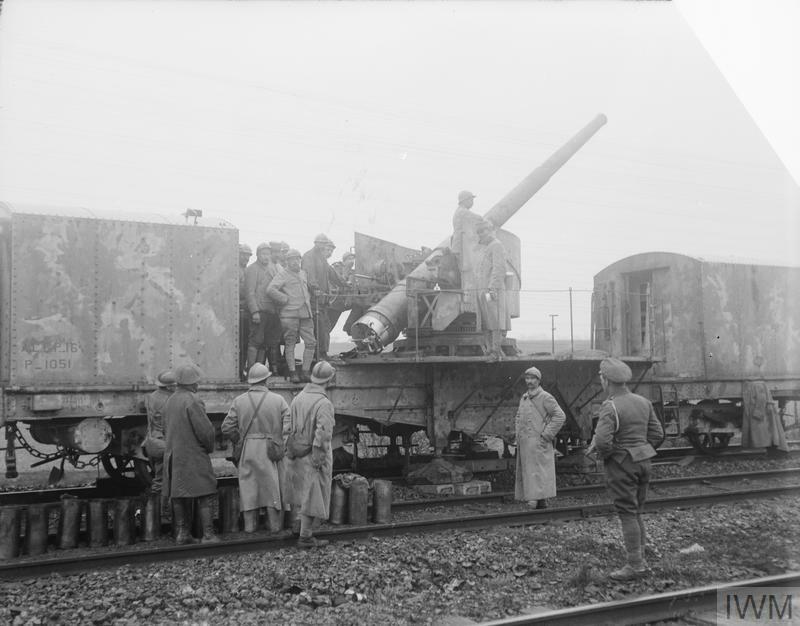 Arriving at Boves carry on until the second set of traffic lights and then turn right in the direction of Longeau-Amiens on the D935, then left straight after at the third set of traffic lights in the direction of Cottenchy (D167). At the end of this road, turn right in the direction of Cagny-Amiens on the D116. Carry on for 0.4 kilometres then turn left on the D167 in the direction of Sains. 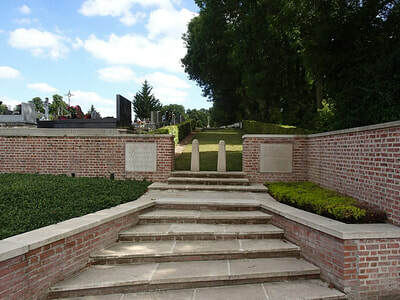 Carry on up a steep hill, where the first CWGC signpost will be seen, and at the top of the hill turn left at the second CWGC signpost, and Boves West Communal Cemetery and Extension is on the right hand side. 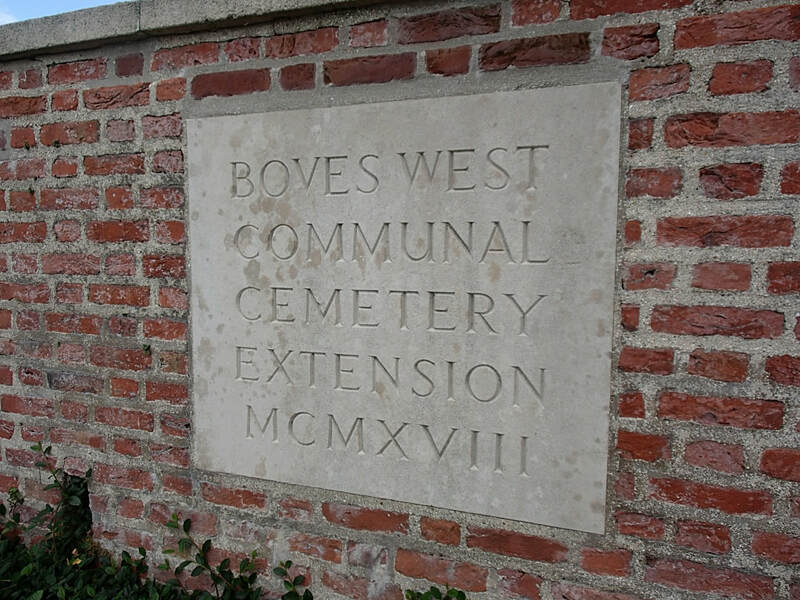 Boves has two communal cemeteries, on either side of the river. 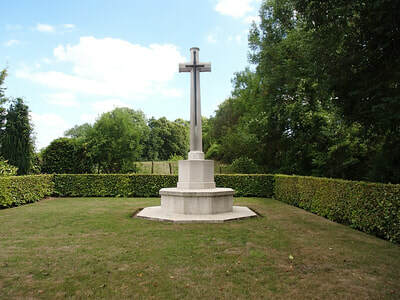 The 49th Casualty Clearing Station was at Boves from 23 April to the end of August 1918 and the 1st Canadian and 4th Canadian during August 1918. 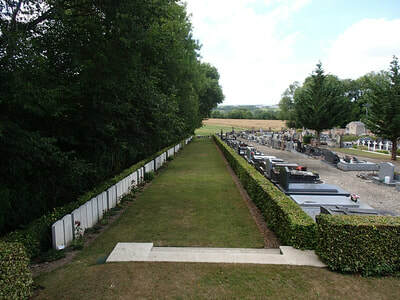 The burials in the two communal cemeteries and the extension to the West cemetery are mainly those of soldiers who died in the three hospitals. BOVES WEST COMMUNAL CEMETERY contains 51 Commonwealth burials of the First World War and 12 French graves. 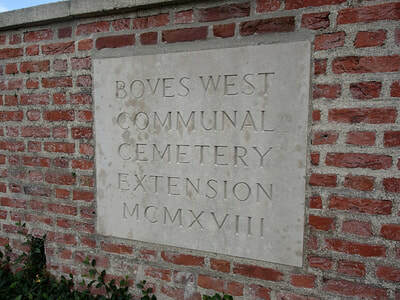 BOVES WEST COMMUNAL CEMETERY EXTENSION was made in August 1918 and after the Armistice, 32 graves were brought into it from Boves Military Cemetery. 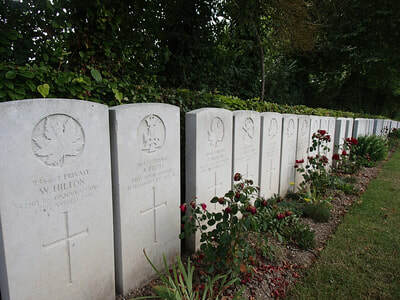 It now contains 91 Commonwealth burials of the First World War and the grave of one unidentified airman of the Second World War. 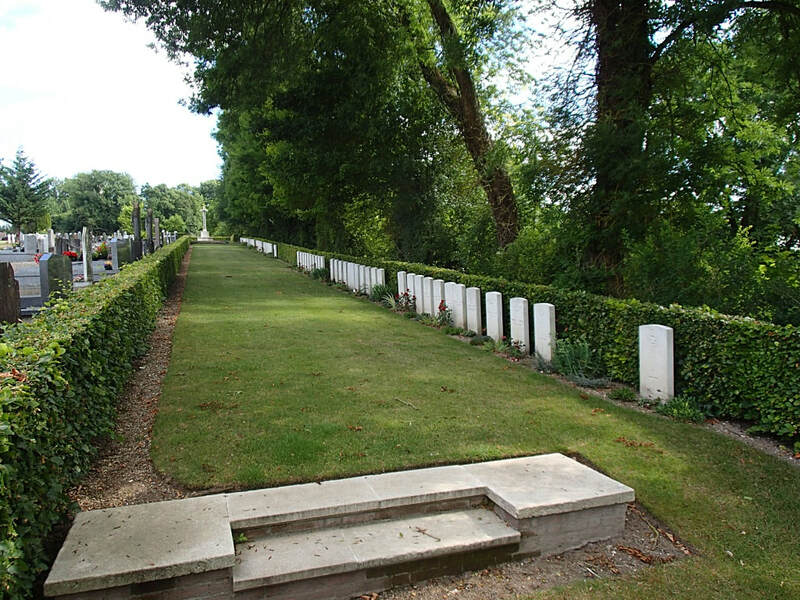 BOVES EAST COMMUNAL CEMETERY contains 15 Commonwealth burials of the First World War. 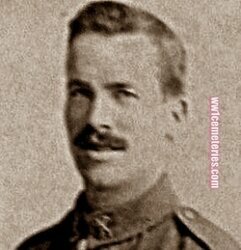 6th April 1918, aged 23. Son of George and Charlotte Rebecca Chant, of 22, Chalk's Cottages, Angmering, Littlehampton, Sussex. 9th April 1918, aged 20. 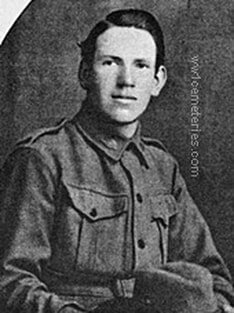 A bank clerk prior to enlisting, he embarked from Sydney aboard HMAT Ascanius (A11) on 25 October 1916. On 9 April 1918, he was killed in action near Amiens, France. 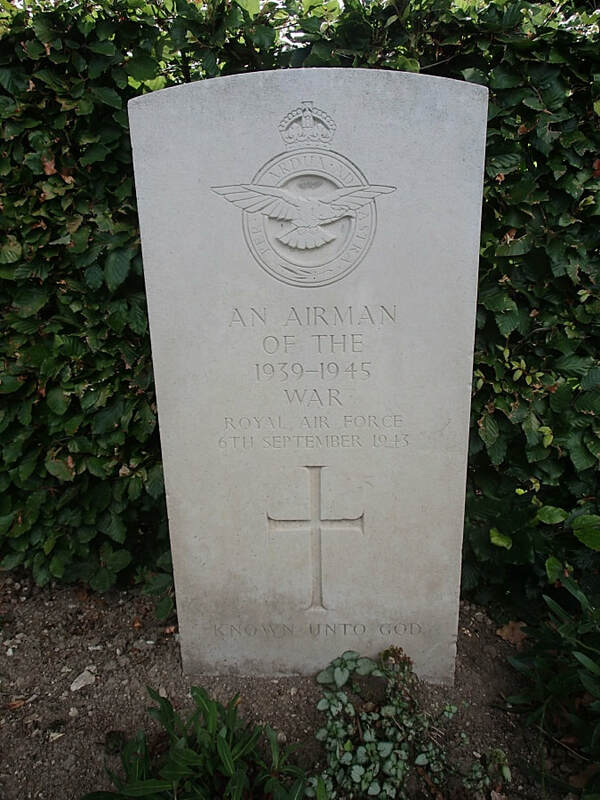 5th April 1918, aged 25. 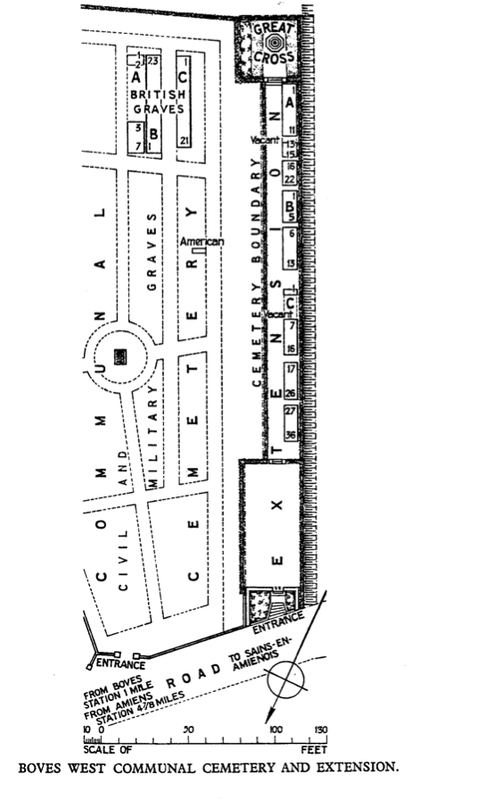 Son of George and Elizabeth Paterson. Native of Scotland.